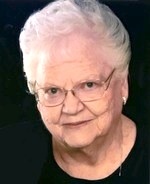 Sandra Sue “Sandy” Husted passed away May 30, 2017 at her home. Funeral Service will be 10:30 am Friday, June 2, 2017 at the Antioch Community Baptist Church, 22668 S. Waverly Rd, Spring Hill, KS 66083. Burial will follow at Osawatomie Cemetery. Visitation 5-7:00 pm Thursday, June 1, 2017 at Bruce Funeral Home, 106 S. Center, Gardner, KS 66030 913-856-7111. Memorial contributions may be made to the Antioch Community Baptist Church or the American Cancer Society (for the Relay for life of Jo-Dotte). Sandra was born September 8, 1936 in Stanton Township, rural Miami County to Ashford Raymond and Zola Hazel (McDowell) Castor. She started school at Oak Grove Rural School and then transferred to the old South School in Paola. Sandy graduated from Paola High School in 1954. The next day she started work for Mr. Carl Gump, the High School Principal, and continued to work for the next three years. Sandra married John Husted, Jr., son of Mr. and Mrs. John Husted, Sr. of Osawatomie, KS, on March 27, 1955 at the Paola United Methodist Church, by Reverend Gilbert Meyers. In 1958, she joined John in his farming endeavors of raising crops, hay, cattle and hogs. They each had their own tractor and put in many hours of working together. In 1970, they left the farm as the Fed. Corp. of Eng. had begun buying up all the land for the Hillsdale Lake. Sandra and John bought the Old Antioch Country Store in NW Miami Co., which she and her family operated. In 1963, they were blessed with a baby girl, Malea Lynn, and Sandra became a stay at home mom to be with her baby. She worked for 31 years at Bill Bond Prescriptions and Gardner Pharmacy. Sam, Stacy, Bobbie Marian, Debbie and Gilbert were like her family, she loved working there. Sandy was a member of the Antioch Community Baptist Church. She was a 4-H leader for the Hillsdale Hustlers for years; she was on the Miami Co. Fair Board and Rodeo Queen Chairman. She will be dearly missed by family and friends. Sandy was preceded in death by her parents; daughter, Malea Lynn Husted Lutz in 2006 and sister, Karen Lee Bickham. She is survived by her husband of the home, foster daughter, Skye and Eric Starner of Greeley, Co; brother, Bill and Therese Castor of South Lake, TX; nephews: Connor Castor of South Lake, TX and Carl Bickham of Bristow, OK; niece, Christa Kellogg of Augusta, KS; grandchildren, Layne, Mariah, Ellie, Evan and Kyle and son-in-law, Milton Lutz.